People typically report substantive changes to their personality when they become intoxicated, but observations from outsiders suggest less drastic differences between “sober” and “drunk” personalities, according to research published in Clinical Psychological Science, a journal of the Association for Psychological Science. “We believe both the participants and raters were both accurate and inaccurate — the raters reliably reported what was visible to them and the participants experienced internal changes that were real to them but imperceptible to observers,” she explains. The idea that we transform into different people when we’re under the influence is a popular one. And systematic differences in an individual’s sober behavior and their drunken behaviors can even inform clinical determinations about whether someone has a drinking problem. But the science on “drunk personality” as a concept is less clear. In Winograd’s previous studies, participants reliably reported that their personality changes when they imbibe, but experimental evidence for this kind of global change was lacking. Winograd and colleagues decided to bring the question into the lab, where they could carefully calibrate alcohol consumption and closely monitor individual behavior. They recruited 156 participants, who completed an initial survey gauging their typical alcohol consumption and their perceptions of their own “typical sober” personality and “typical drunk” personality. Later, the participants came to the lab in friend groups of 3 or 4, where the researchers administered a baseline breathalyzer test and measured the participants’ height and weight. Over the course of about 15 minutes, each participant consumed beverages — some drank Sprite, while others consumed individually-tailored vodka and Sprite cocktails designed to produce a blood alcohol content of about .09. After a 15-minute absorption period, the friends worked through a series of fun group activities — including discussion questions and logic puzzles — intended to elicit a variety of personality traits and behaviors. The participants completed personality measures at two points during the lab session. And outside observers used video recordings to complete standardized assessments of each individual’s personality traits. As expected, participants’ ratings indicated change in all five of the major personality factors. After drinking, participants reported lower levels of conscientiousness, openness to experience, and agreeableness, and they reported higher levels of extraversion and emotional stability (the inverse of neuroticism). The observers, on the other hand, noted fewer differences across the sober and intoxicated participants’ personality traits. In fact, observer ratings indicated reliable differences in only one personality factor: extraversion. 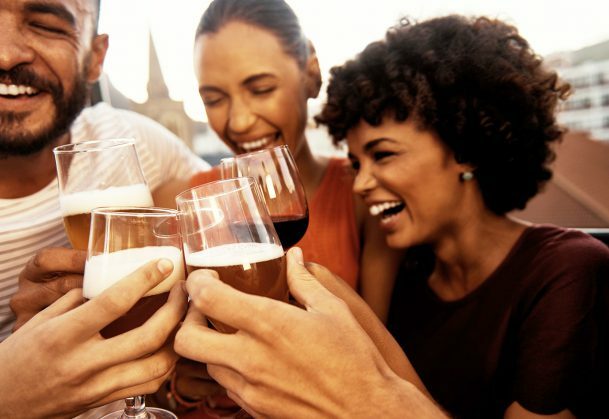 Specifically, participants who had consumed alcohol were rated higher on three facets of extraversion: gregariousness, assertiveness, and levels of activity. Given that extraversion is the most outwardly visible personality factor, it makes sense that both parties noted differences in this trait, the researchers argue. They acknowledge, however, that they cannot rule out other influences — such as participants’ own expectations of their drunk personality — that may have contributed to the discrepancy in ratings. “Of course, we also would love to see these findings replicated outside of the lab — in bars, at parties, and in homes where people actually do their drinking,” says Winograd. “Most importantly, we need to see how this work is most relevant in the clinical realm and can be effectively included in interventions to help reduce any negative impact of alcohol on peoples’ lives,” she concludes. Co-authors on the research include Douglas Steinley of the University of Missouri, Columbia; Sean P. Lane of the University of Missouri, Columbia and Purdue University; and Kenneth J. Sher of the University of Missouri, Columbia. You should try this experiment with people who are alcoholics or suffer from mental illness. These people seems to be the ones who change the most. Also these people with an abusive relation to alcohol tend to drink a lot more than the ones in your experiment. An already fragile personality cracks down when alcohol is added and they soon start to act as when they are sick. Alcohol can also be a trigger to start manic episodes, wich are a really great personality changer. Someone who already feels that everyone is “out to get me” in some way,weather real or not, does that parinoid feeling increase or is it just not as well avoided with compensating behaviours ? I was never a chronic drinker, and my drinking habits never seemed to fit any clinical description of alcoholism. However, as a young adult (approx. 18-32)there was a number of occasions when I drank enough to experience a partial blackout. During the few times I experienced this mental state, I almost invariably got into trouble. Interestingly, while my “ethical subroutines” are a very potent determinant of behavior when I am sober, give me a high enough blood-alcohol content, and those same ethical subroutines go off-line. Of course, I eventually figured this out, and I have had no trouble abstaining. I’m on permanent designated-driver duty. And that’s ok. But as a result of my particular alcohol behavior dynamic, I have come to see myself as almost two different people. There’s Drunk-Tod, and there’s Sober-Tod. And while Sober-Tod has never so much as had a speeding or parking ticket, Drunk-Tod has five hits on a criminal background check. I would love to see a study where the participants are brought up to about 1.3 or 1.4, and then submitted to a test of their ethical decision-making process.